BE SURE YOU ARE NOT DAYDREAMING when you use the rotary scaler. Needle scalers accomplish their task with an assembly of individual needles impacting on a surface hundreds of times a minute. The advantage of using individual needles is that irregular surfaces can be cleaned readily. See figure 1-66. PORTABLE PNEUMATIC IMPACT WRENCH The portable pneumatic impact wrench (fig. 1-67) is designed for installing or removing nuts and bolts. The wrench comes in different sizes and is classified by the size of the square anvil on the drive end. The anvil is equipped with a socket lock, which provides positive locking of the socket wrenches or attachments. Nearly all pneumatic wrenches operate most efficiently on an air pressure range of 80 to 100 psi. Lower pressure causes a decrease in the driving speeds, while higher pressure causes the wrench to overspeed with subsequent abnormal wear of the motor impact mechanisms. Before operating the pneumatic impact wrench, make sure the socket or other attachment you are using is properly secured to the anvil. It is always a good idea to operate the wrench free of load in both forward and reverse directions to see that it operates properly. Check the installation of the air hose to make sure it is in accordance with the manufacturer's recommendation. SAFETY PRECAUTIONS FOR USE WITH PNEUMATIC TOOLSGENERAL When using pneumatic tools, you should use the following procedures: You should wear and use necessary personnel protective devices. Pneumatic tools shall not be connected to, or driven by, air pressure in excess of that for which the tools are designed. The wearing of appropriate eye protection equip- ment is mandatory for Navy personnel when operating pneumatic tools. You should be authorized and trained to operate pneumatic tools. Pneumatic tools should be laid down in such a manner that no harm can be done if the switch is accidentally tripped. No idle tools should be left in a standing position. Pneumatic tools should be kept in good operating condition. They should be thoroughly inspected at regular intervals with particular attention given to the ON-OFF control valve trigger guard (if installed), hose connections, guide clips on hammers, and the chucks of reamers and drills. Pneumatic tools and air lines may be fitted with quick-disconnect fittings. These should incorporate an automatic excess-flow shutoff valve. This valve automatically shuts off the air 1-41 Figure 1-66.Needle impact scaler. 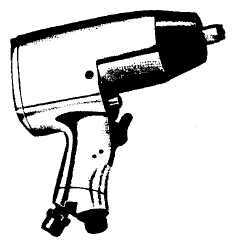 ABDf0171 Figure 1-67.Pneumatic impact wrench.